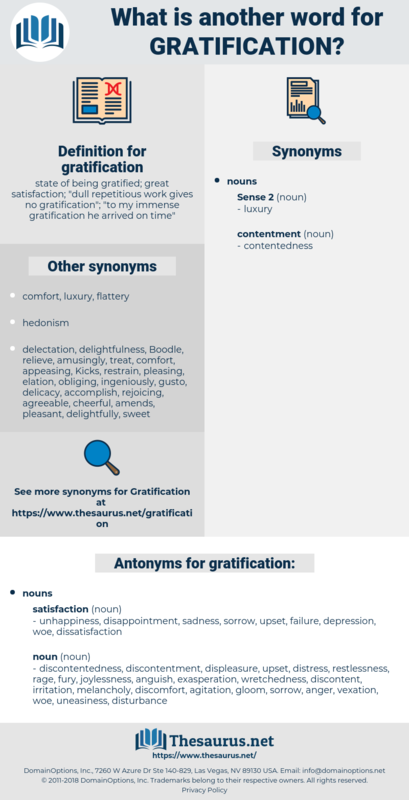 What is another word for gratification? 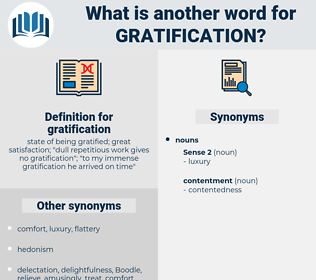 state of being gratified; great satisfaction; " dull repetitious work gives no gratification"; " to my immense gratification he arrived on time"
comfort, reward, complacency, fun, joy, fulfillment. pleasure, appreciation, gratuity, bonus, delight, contentment, enjoyment. disappointment, depression, unhappiness, sadness, failure, dissatisfaction. discontentedness, discontentment, displeasure, upset, distress, restlessness, rage, fury, joylessness, anguish, exasperation, wretchedness, discontent, irritation, melancholy, discomfort, agitation, gloom, sorrow, anger, vexation, woe, uneasiness, disturbance, aggravation. But, for his gratification upon this particular point, I will repeat, in substance, what I then said as to fighting the battle in the Union. And hardly anything the world, I suppose, could have given me such deep gratification at the moment. head trip, satiation, humoring, pleasing, indulging, self-gratification, pampering, indulgence.